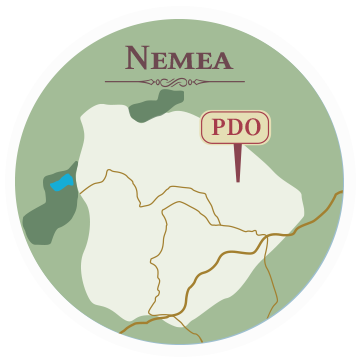 Nemea climate is characterized as sub-arid and sub-humid, with average annual precipitation 700-800 mm and average temperature that ranges from 16 to 18 Celsius degrees. This special microclimate of the region is characterized by a main valley surrounded by mountains, and weather conditions ranging from mild cold winters to the warm and relatively dry summer, with several differences though between short distances within the P.D.O. Nemea zone. The clay soil is ideal for good drainage and fertility. Observing the diversity of microclimates, one discovers the different delicious result of wines between the vineyard sites, the most impressive of all being the uniqueness and importance of every year to the character of the legendary Nemea wine. The content of soil in organic and inorganic components, such as calcium carbonate, is an important factor for the installation of vineyards with high quality characteristics of a Terroir, combining the ideal soil and climate conditions. The location of the vineyards and the ideal altitude of 350-400 m act as catalysts for the proper maturation of the grapevines, which, combined with humidity from the mythical river Asopus, create a unique microclimate and reveal the unique Terroir of Nemea.